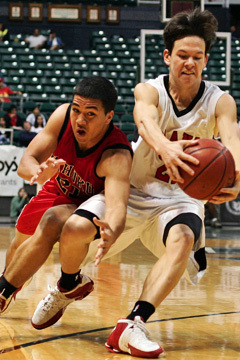 Ryan Dung of Iolani barely beat Shiloah Te'o of Kahuku to a loose ball during last night's second semifinal. The Iolani Raiders belong to the mileage-plus club. Next destination: the final of the Hawaiian Airlines/HHSAA Boys Basketball State Championships. Subbing freely and often, the Raiders got plenty of mileage out of their reserves in a 60-36 trouncing of Kahuku last night at Stan Sheriff Arena. Seeds: 1. Iolani. 2. Kaimuki. 3. Kamehameha-Hawaii. 4. Baldwin. 15: Waimea vs. Saint Louis, 2:30 p.m.
16: Kalaheo vs. Kamehameha-Hawaii, 4 p.m.
17: Kamehameha vs. Kahuku, 6 p.m.
18: Kaimuki vs. Iolani, 8 p.m.
KAHUKU--Pele Soliai 0, Kaulin Krebs 0, Iona Teriipaia 2, Devin Unga 4, Shiloah Te'o 3, Okesene Ale Jr. 6, Ian Fujinaga 2, Tiavete Oto 2, Kevin Unga 15, Manti Te'o 0, Jacob Kahawaii 0, Charles Bell 2. IOLANI--Kela Marciel 2, Vinny Nip 0, Barry Kang 3, Ryan Dung 9, Case Miyahira 6, Taylor Mounts 0, Kekai Kealoha 3, Kawika Shoji 19, Berton Wong 2, Brandon Ball 0, Jon Takamura 3, Liloa Nobriga 7, Blayne Yama 2, Wally Marciel 2, Kiran Kepo'o 2. 3-point goals: Kahuku 1 (S. Te'o), Iolani 6 (Dung 3, Miyahira 2, Kealoha). A crowd of 1,999 saw top-seeded Iolani (22-8), the No. 1 seed, move within one victory of an unprecedented fifth state crown in a row. Standing in the Raiders' path is Kaimuki, the Oahu Interscholastic Association champion. The title game tips off at 8 p.m.
Senior Kawika Shoji led the way with 19 points on 9-for-12 shooting. Reserve guards Ryan Dung and Case Miyahira combined for five of Iolani's six 3-pointers as Iolani caught fire early and rolled to another rout. "Our second unit shot the ball well, so that made it easier. We kept the tempo fast. We knew after so many overtime games, Kahuku would be tired," Iolani coach Mark Mugiishi said. It was Kahuku's third game in as many nights, and the Red Raiders spent much of last night chasing Iolani. Thanks to an early lead, Mugiishi gave his reserves more minutes, leaving more gas in the tank for his starters. They will need as much energy as possible against a Kaimuki team that nearly upset Iolani in December. In that game, Kaimuki led most of the way before Iolani rallied in the final 4 minutes for a nonconference win. Keone Reyes was a factor in that game, providing a matchup problem for the relatively svelte Raiders. "Kaimuki is a smart, good team," Mugiishi said. "They're fundamentally sound and patient." Tonight, the Raiders will be as fresh as any team could possibly be for a state final. "They play 5-for-5," Kaimuki coach Kelly Grant said, referring to Mugiishi's substitution pattern. "Doc's no dummy." Indeed, Iolani used its trademark swarming defense to counter the state's leading scorer, Okesene Ale Jr. After scoring 50 points in Kahuku's two tourney wins, he was cornered and trapped often by Iolani. The senior guard finished with only six points on 2-for-13 shooting. Kahuku, the OIA runner-up, was a step slower than usual in its third game in as many nights. The Red Raiders (20-8) play Kamehameha for third place in today's 6 p.m. game. "We could've executed, could've played better. Maybe we could've pulled off something, or maybe they're just a better team," said Kevin Unga, in tears after leading Kahuku with 15 points and nine boards. "They're used to it. This is nothing to them." Iolani shot 51 percent from the floor, including 6-for-15 from 3-point range, and limited Kahuku to 31 percent from the field. Iolani also outrebounded Kahuku 30-24. Shoji was on a tear at the start, hitting his first five shots, including a 3-pointer. He closed the first quarter with 11 points as the Raiders took a 15-7 lead. Ale was smothered by double-teams and had only two points in the opening quarter. Kahuku continued with a man-to-man defense in the second quarter -- a departure from its usual 2-3 zone. Fatigue began to show for the Red Raiders, who were outrebounded 11-6 in the opening quarter. Dung's open 3-pointer and inside buckets by Liloa Nobriga and Jon Takamura extended Iolani's lead to 24-11 midway through the second quarter. Iolani's bench came through as Dung nailed his second trey and Miyahira hit another. After Kekai Kealoha drove for a double-pump layup and Nobriga hustled for a putback before the buzzer, the Raiders led 34-18 at intermission. Dung and Miyahira each made a pair of 3-pointers before halftime. In all, 21 points came from Iolani reserves before the break.